My aim is to make your special event unforgettable for all the right reasons. You are guaranteed a successful event that will be on all your guests' lips long after your event, or your money back. 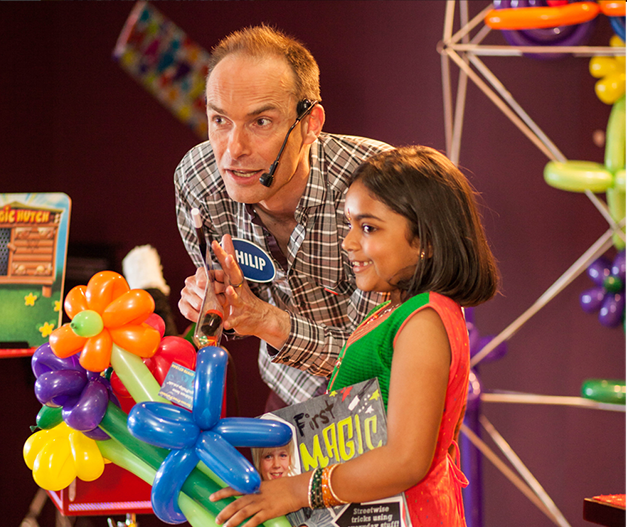 50 minute Birthday Party Magic Show where your child is the star. Everyone, adults included, will be transfixed from beginning to end of this hilarious show, brimming with participation and enjoyment. 2 hour Stress-Free Birthday Party Magic and Games Package with your child as the star, crammed with action, fun and comedy that will make the walls of your party room rock with screams of glee and delight. Flexible Christening entertainment to suit you. 50 minutes of comedy and magic that appeals to a mixture of ages to ensure everyone gets to join in the fun, grown-ups included, making your Christening party a shared family memory for ever. Extend your christening entertainment into a full 2 hour party solution by adding EITHER fun games with music and dancing and a balloon sculpture for all the kids OR Mix and Mingle Close-Up Magic for the grown-ups and families - it’s like having your very own Dynamo at your Christening party! 50 minutes of memorable moments on your special day, full of comedy, puppets, and lots of magic. There’s fun for the little ones and more sophisticated magic for the big ones! Make the magic last for 2 hours by adding EITHER dancing and games set to music with a balloon sculpture for each child included OR strolling table-to-table magic for a more intimate entertainment experience for young and old. School entertainment tailored to the age group of your pupils. 50 minutes of engaging magic, comedy and participation that has been uniquely crafted to work well in the school environment. Each show is tailored to the age group of the pupils or structured to appeal to a mixture of ages if the show is for the whole school. The children get to help in the show and everyone is made to feel super special. Wonderful Wizardry and Wand-Waving for older kids. Turn any event where older children need to be engaged and entertained into a memorable experience that is so much more than just being entertained. 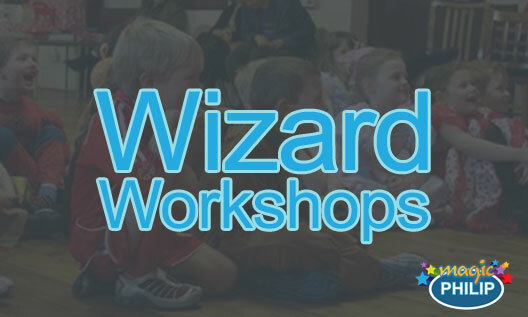 The Wizard Workshop teaches children skills and techniques they will have for life, carrying forward the passion of magic and performing. Suitable for groups of children aged 8 and up. 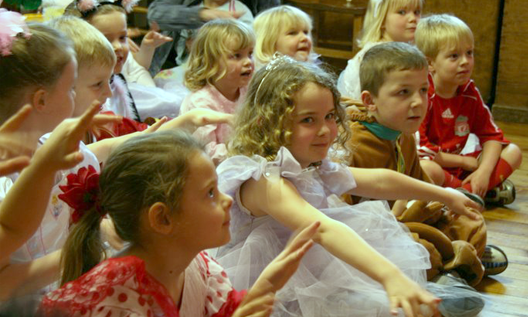 Festive entertainment for children and families ensuring everyone is happy at your Christmas party. 50 minutes of Festive Fun with Magic and Comedy where the children are the stars. 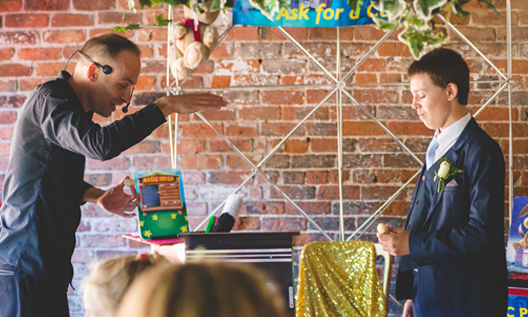 The Christmas magic show is suitable for mixed-age audiences, grown-ups included. 2 hours of extended Christmas Fun - add Christmas party games and music to the Christmas magic show and keep the festive spirit going until the special build-up of Father Christmas’s arrival. You are beginning to feel like part of the family! That was the fourth party you have done for us and frankly that says it all. You are beginning to feel like part of the family - it would not be a party without you! Once again you were amazing, everybody loved it, young and old alike. The children were gripped from beginning to end. Thank you so much and we will see you at the next party. Thank you for Lucas's party. The kids all had a fantastic time, and the adults (myself especially) marveled at your ability to keep thirty five children both entertained and under control. If that's not magic, I don't know what is! We look forward to seeing you again soon. It was a joy seeing the children howling with laughter! Thank you for making Conrad's party truly magical! The laughter coming from the kids throughout the party was a pleasure to hear. I have had many parents approaching me on the playground to tell me that their child was raving about you and it seems that most of the boys actually slept with their wands in their hands… and one of them even took it to school yesterday! 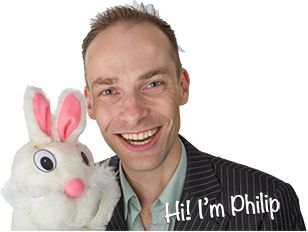 I am a children’s entertainer working in Manchester, Greater Manchester, Hale, Bowdon and Didsbury for over 20 years. I do travel further afield but I do get booked up quick. Your party guests' enjoyment is my top priority. I want everyone at your party to have a very special time and make it an event they will never forget. Your party entertainment is tailored to the age of your audience. This ensures everyone will be included and have the best time at your party.